FIND YOUR EDGE AT WORK! FIND YOUR UNIQUE PERFORMANCE ADVANTAGE AT WORK! Strengths Discovery Questions from Dale Cobb on Vimeo. Here are 5 question sets. They spell out the word S.I.G.N.S. as in signs you may have a strength. Strong? – What activities or topics make you feel strong? What are the activities and topics that generate strong positive emotions? World’s Greatest Investor, Warren Buffett says he tap dances to work every morning… What are the activities that make you want to dance? Intense Interests? What was your favorite subject in school or hobbies outside of school? Indicators include the magazine and book sections you’re drawn to, How you spend your money or discretionary income after the bills are paid, how you spend time after work and what takes up space in your home or garage… other than the basics. What are you always thinking about? Growth? What areas do you grow or get better quickly? What activities seem to come easy or more effortless? Needs? What do you “Need” to do. What’s inside, that has to come out? Success? What areas have you experienced the most success, achievement and results? What kind of problems do you solve? The Strength Nobody Wants from Dale Cobb on Vimeo. List every defeat, disaster and difficulty that you have survived and gone on to overcome. Consider each a WIN and a STRENGTH you can use to ad value. Strengths Summary I from Dale Cobb on Vimeo. Pull together a preliminary "Strengths Summary" with brief notes on yourself. Remember your strengths are any internal or external resource that helps you ad value or make a contribution in the marketplace. Decision Strengths Overview from Dale Cobb on Vimeo. Character Choices including integrity, honor, morals, ethics, standards of right and wrong. Employers are concerned with dependability, attendance and promptness. They are also concerned with honesty and keeping your commitments. Courage which means the willingness to do something while you’re scared is also a character strength. These all involve choices. Mission and Goals including focus, direction and planned destinations. You will attract more people when you have a clear direction and are focused on a specific destination. It may sound noble to walk into a job interview and tell the hiring manager you’re willing to do anything. Being willing to start at the bottom and work up is one thing, but as a rule, managers hire and promote people who know where they’re going! #3. Attitude, Mindset or Thought-Choice is a powerful strength. Examples included gratitude, humility, optimism, serving, generosity, cooperation and Action-Bias. While in one sense, attitudes are developed over time, in another sense, you can choose anyone of these in any given moment. Every thought you and I hold has 3 results or consequences. There is a physical result. Positive thought choices produce positive chemicals like endorphins and serotonin. There is an emotional result that produces positive feelings. And there is the Vibe result that impacts everyone around you. This is why companies will hire for thought choice, mindset or attitude. #4. Appearance, Dress or Look is the next strength you can choose immediately. Employers hire and promote candidates and employees who represent their desired brand image. Always manage your appearance. Dress and appearance are very powerful forms of non-verbal communication. On a scale from 1-10 how affective is your appearance and wardrobe? #5. Geography or Location is the last Chosen Strength I’m going to talk about with regard to your career. I often refer to this as the “Nashville Principle”. That means if you want to become a star in Country Music, you need to move to Nashville! If you’re not yet 18, do what Taylor Swift did and convince your parents to move with you. There is a unique “Geography of Success” that goes with many positions and roles. If you want to be a Broadway performer, you need to move to New York. There is an optimal environment for your career choice. In future sessions we’ll be looking at your discovered or natural strengths, your developed strengths and these decision based strengths individually using indicators or worksheets that will help you with both the job shaping and job search aspects of career development. Developed Strengths Overview from Dale Cobb on Vimeo. #1 Skills are Mastery, Proficiency and Competency with Methods, Steps, Sequences, Tool Use and Technology) Skills are developed through deliberate systematic effort, intentional practice and often supported by training and coaching. You want to focus on developing skills that compliment or build on your natural talent. For instance, one example of a natural talent is rhythm. Complimentary skills might be dance or drums. Another natural talent is 3 Dimensional Visualization. Complimentary skills might include architecture drafting, computer graphics animation, construction trades or automotive repair. #2 Knowledge including General Vocabulary, Professional or Industry Specific Terminology, Rules, Regulations, Laws, Principles, Theories, Information, Facts and Understanding. You want to focus on developing knowledge in areas that compliment or synergize with both your natural talents and the subjects you’re passionate about. If I wanted to become a professional baseball player, I should get at least basically acquainted with the rule book and arm myself with an understanding of sacrifice bunts and sacrifice flies. #3 Education including reading, attending lectures, classes, coursework, degrees, certifications and certificates. You’ll want to structure your education around gaining talent based skills, passion based knowledge and your education should ideally correlate with your natural Learning Style. #5 Resources including Tools, Equipment, Technology and Machines. I’m writing and recording this material on a MacBook Pro. I have lighting and backdrops. You will probably need to have a set of tools even if it’s just the right clothes or wardrobe to get the job and transportation to get there. Discovered Strength Dimensions Overview from Dale Cobb on Vimeo. After watching the video above think about the strength definitions below. As you go through each one, list any strength you think you might claim as your own. In later segments you will have the opportunity to dive deeper into each strength with indicators and assessments. Contribution (Result, Benefit, Added Value, Difference Maker, Better Service, Deliverables, Increased Profit, Reduced Expenses, Performance, Solving Problems, What You’re Paid For) Contribution is something you give that helps attain an end result. t’s the positive change that happens when you walk in the room, when you join a business unit, team or organization. Personality is the organization of an individual’s distinct traits and temperament. Many employers give pre-employment personality assessments based on a belief that individuals have traits that will make them more successful. Examples of personality include shy or outgoing, structured or flexible and people focused or task focused. Talents (Natural Ability, Aptitude, Gift, Knack, Flair, Bent, Instinct, Genius, Inclination, Brilliance, Forte, Aptness) Innate ability makes performing and excelling at specific tasks easier. It also makes developed strengths like skill and knowledge acquisition easier. Talents include Aptitudes like the ability to Visualize in 3D, Number Facility and Finger Dexterity. Talents include Approaches like Thinking, Relating, Influencing and Executing. Learning Style (Perception, Organization, Retention and Response to Instruction Methods, Optimized Pattern of Acquiring and Processing Information) Examples of learning styles include Reading, Listening, Discussion and Doing. Signature Strength from Dale Cobb on Vimeo. What's Trying To Get Out? What's inside of you that needs to be expressed? Is it represented in one or more specific activities? Is it mental-intellectual, physical, relational....or some combination? There were subjects in school that you were ___________________________. There were classes where time went by _______________________________. Myth: As I grow older, my basic personality and core talents change. Truth: Your talents won’t change. You can make the biggest changes by developing the talents you were born with. Myth: Strengths are simply what I’m good at and weakness are simply what I’m bad at. Myth: I will grow most in my areas of weakness. Truth: You may occasionally need to work in an area of weakness. But your biggest contributions to a team or employer will come when you contribute your talent and strength. How aware are you when it comes to your strengths and weaknesses? Try to list 4 or 5 of your top strengths. How authentic or aligned are you with regard to your top strengths? How many hours a week are dedicated to using these top strengths? How many hours do you spend using a weakness? List a time at work, school or in a volunteer opportunity where you felt like a duck in the desert or a fish out of water. What aptitude did you lack for the task or activities? 1. What activities did you love between the ages of 5 and 14? 2. What activities were you good at? 3. What subjects came easily in or out of school? 4. What were you complimented on? Write this information down in a workbook or binder. Uuriintuya Byambatsogt is a headhunter and career management coach, the founder of Global Career Management Consulting. She strives to help people find their professional passion and achieve personal excellence. The 4 Strengthsfinder Domain Types from Dale Cobb on Vimeo. 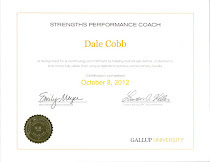 The Purpose of this letter is to describe the benefits I enjoyed from my coaching experience with Dale Cobb. I had a very specific issue, which I needed help getting over the hump with. Our conversations were very helpful in keeping me on track and getting me to the finish line. I believe that Dale is a keen observer of the human condition and has the ability to reflect back an individuals thoughts and goals as one strives for success. I found the services offered by Dale to be timely and effective. In the future, I am sure I will be presented with challenges that require outside assistance. When that time comes, I will not hesitate to call on Dale for his fresh bright and insightful guidance. "Dale has always impressed me with his integrity, marketing insights, compassion and follow through. He thinks outside the box, asks the questions that others fail to ask and has a real heart for training others to be the best they can be. You can count on Dale." As a strengths strategist and and performance coach, Dale helps individuals and organizations maximize their effectiveness. He is the founder of SUCCESSPATH Career Development where he helps clients discover, develop and deliver their unique strengths in the workplace. 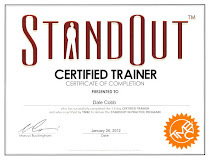 Dale graduated from The Coaches Training Institute in 1999, has been certified as a "StandOut" trainer by the Marcus Buckingham Company and a "Strengths Performance Coach" by the Gallup organization. He lives on the Pismo Coast with his wife Susy. The path to success begins with understanding yourself. Everybody is a genius. But if you judge a fish by it's ability to climb a tree, it will live its whole life believing that it is stupid. The only way to do great work is to love what you do. If you haven't found it yet, keep looking. Don't settle. As with all matters of the heart, you'll know it when you find it. Your time is limited; so don't waste it living someone else's life... Have the courage to follow your own heart and intuition. They somehow already know what they already want to become. Everything else is secondary. Maintaining focus is the key to success. You should understand your circle of competence, the thing that you're good at, and spend your time and energy there. If there is any difference between you and me, it may simple be that I get up every day and have a chance to do what I love to do, every day. If you want to learn anything from me, this is the best advice I can give you. Voice lies at the nexus of talent (your natural gifts and strengths), passion (those things that naturally energize, excite, motivate, and inspire you), need (including what the world needs enough to pay you for), and conscience (that still, small voice within that assures you of what is right and that prompts you to actually do it)... There is a deep, innate, almost inexpressible yearning within each one of us to find our voice in life. The Hedgehog Concept is an operating model that reflects understanding of three intersecting circles: what you can be the best in the world at, what you are deeply passionate about, and what best drives your economic or resource engine. It's essential for today's employers to recognize and cultivate their employees' talents and gifts if they want to retain them and remain viable in the marketplace. Most Americans do not know what their strengths are. When you ask them, they look at you with a blank stare, or they respond in terms of subject knowledge, which is the wrong answer. "Marty Rodriguez Century 21 Real Estate is built around one concept: everybody only does what he or she does best. Each employee makes the most of a single focused attribute. In my office, each person specializes in one aspect of the transaction. The mantra is, Do what you do best. I list, sell, and negotiate. My buyer's agents only sell. Our head escrow coordinator closes more escrows in one year than most people close in an entire career." "I love what I do and can't imagine anything that I would enjoy more. The last vacation I took was about 20 years ago. I was miserable." Dolly Lenz, #1 Realtor in U.S. I've learned to draw and read a little bit, but I'm really still a very one-sided person and I don't know a great deal. I have limited intelligence and I use it in a particular direction. Most people reach adulthood with no idea what their strengths might be; yet, they are painfully aware of their failings. Success is achieved by the development of strengths, not by the elimination of weaknesses. Name any successful person. Does this person have weaknesses? You bet! God has given each of us the ability to do certain things well. Your ability unveils your destiny. ...I was never a businessman... I mean I can add and subtract but I hate to read sheets of numbers. I like to write stories. If you have twelve crayons in your box, use your creativity and resourcefulness to make the best picture you can with these. Don't spend time worrying that someone else has forty-eight or sixty-four crayons. As you are, you are basically adequate to life. Picasso is weak on Einstein's theory of relativity, and Einstein is weak on impressionist painting. I can assure you they did not become successful people in their fields by trying to counter-balance their weakness. If Benjamin Franklin would have tried to be a general and George Washington would have tried to be an inventor, we'd probably still be living in an English Colony with electricity. If there is nothing very special about your work, no matter how hard you apply yourself, you won't get noticed, and that increasingly means you won't get paid much either. Talent, I love that word! So different from employees. So different from personnel. So different from human resources. Talent! Just uttering the word per se makes you puff up and feel good about yourself! ...I love it because of the...images ...that it immediately brings to mind. Yo-Yo Ma playing the cello.Pavarotti at full volume. Gene Hackman or Nicole Kidman in complete command of a scene. Derek Jeter turning a double play. Michelle Kwan doing a triple axel. sixth championship during his reign with the team. in that role, but you will become betterpaid for that. Our free market system pays for performance at some point. When you have a natural aptitude coupled with desire experience, the result is productivity plus. I'm a lousy guitar player and an even lousier piano player. Had I not got Edge close by who was an extraordinarily gifted complex musician, I would be hopeless. Had I not got Larry and Adam, these melodies would not be grounded. But it's still very difficult for me to have to rely. Your weakness, the blessing of your weakness is it forces you into friendships.